Be the first to share your favorite memory, photo or story of Mearl. This memorial page is dedicated for family, friends and future generations to celebrate the life of their loved one. 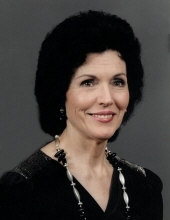 Mearl Moore, daughter of the late Joseph and Lucy (Adams) Hayes, was born February 28, 1930, near Manes, Missouri, and entered into heavenly rest April 11, 2019, in Mountain Grove, Missouri. She was 89 years, 1 months, and 14 days of age. Mearl was united in marriage to Ellis Ottis Moore on July 28, 1945, in Tulare, California. They were blessed with six children. They raised their family in the Norwood, Missouri area. Mearl worked for Brown Shoe Company for many years before retiring in 1994. After 61 years of marriage, Ellis passed away on April 25, 2007. Mearl was a loving wife and devoted mother who worked hard to make sure her family had everything they needed from food to clothing. She truly loved her grandchildren, great-grandchildren, and great-great-grandchildren. She was an amazing cook and enjoyed preparing meals for frequent family gatherings. Some of her family’s favorites were her sweet potatoes, pies, ham and beans, and fried chicken dinners. Many wonderful memories were made throughout the years especially at the Thanksgiving celebrations in her home. Mearl enjoyed playing games with her family. Dominoes and Hedbanz were quite popular games at her house. “Rum you up, cup you up” was a favorite with the young ones. Mearl also enjoyed making large gardens each year and sharing the vegetables and strawberries with family and friends. She liked to sew and quilt and had made many gifts for her family. Mearl took great pride in caring for her yard and home. She also had a special love for decorating her home with clocks and mirrors. Sometimes the kids enjoyed trying to count how many she had collected over the years. She liked things to be neat and clean. This contributed to her love of painting, always looking to freshen things up with a new coat of paint. Mearl loved flowers and plants and always had an abundance of them on display. Mearl was saved and baptized at a young age and was a lifelong member of the Oak Grove Free Will Baptist Church, where she remained faithful as long as her health permitted. She was devoted to serving the Lord, praying, and reading the Bible, having read it from cover to cover numerous times. Mearl also had a great gift of singing and could often be heard singing specials at church with her twin sister, Pearl. For many years they touched hearts with their God given talent in the little old country church. Besides her parents and husband, Mearl was preceded in death by one son, David Moore, one grandson, Eldon Ray Moore, and four sisters, Pearl Moore, Wilma Shaw, Alma Hodges, and Marie Lankford. Mearl is survived by three sons, Eldon Moore and wife, Vola, of Elkland, Missouri, Lonnie Moore and wife, Lorna, of Mountain Grove, and Jerry Moore and wife Tammy of Mountain Grove, two daughters, Janice Goad of Springfield, Missouri, and Debbie Heim and husband, George, of Lamar, Missouri, eleven grandchildren, Randal Moore, Rhonda Thomas, Teresa Smith, Karen Collier, Doug Moore, Casey Moore, Marty Moore, Nathan Moore, Chad Robertson, Jacklyn Roy, and Megan Marie Heim Vera, twenty-eight great-grandchildren, Jamie, Justin, Heather, Cody, Jeff, Brian, Randal, Joe, Josh, Brandon, Trisha, Samantha, Seth, Sara, Clayton, Teddy, Ashlyn, Alex, Grace, Carson, Kaden, Dylan, Jacey, Ali, Maddison, Mykka, Jaxton, and Thad, twenty-eight great-great-grandchildren, numerous nieces and nephews, and a host of other relatives and friends that will miss her dearly. The Moore family would like to thank the staffs of Country Living Assisted Living, Hospice Compassus, and Autumn Oaks Caring Center for the love and kindness shown to Mearl in her final days here on earth. The Moore family requests memorial contributions be made to Hospice Compassus or Gideons International in c/o the funeral home. To send flowers or a remembrance gift to the family of Mearl Moore, please visit our Tribute Store. "Email Address" would like to share the life celebration of Mearl Moore. Click on the "link" to go to share a favorite memory or leave a condolence message for the family.